After failing a few times at it yesterday (and lots of times throughout my stitching history), I looked up how to make a french knot. Thanks to this video, I finally got it. And my sampler has turned into a celebration of that lesson. Where Teresa is working on her sampler a short 20-minutes a day in an exercise of control, I've worked on mine all but perhaps 20 minutes. Full on-forget about the laundry-we're eating out tonight crafting going on here folks. Don't you just LOVE those forget-about-everything-but crafting days? They are some of my favorites. I can't wait to see how this progresses. Love the colors! This is a darling idea. You're giving me incentive to pull out the ol' needle and thread! P.S. I especially love the little sitting girl. I love the sampler! It's so darling, and you've inspired me to pull my embroidery project out of it's sleepy nest in my craft closet. Wow, you are really in the groove! 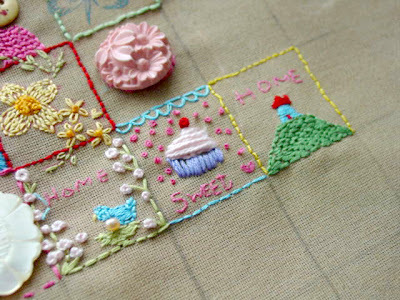 I love French knots - my favourite stitches! PS And the word verification is "fixitst" - Don't you think the rhythm of embroidery is a fixitst for troubled times? Seems like a great way to spend the day. 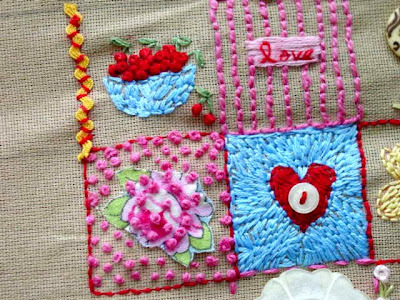 There is something so meditative about embroidery. I LOVE those feelings when crafting is going on...go with it, girl! Your French Knots are great! I love the sampler. Keep up the good work! It's darling! Makes me want to try one. I L-O-V-E this project! I love that you can pick it up whenever you want and work at it, but it is something you can put away if you need to. so fun! i am really loving how yours is turning out! Amy, you rock!! Look at all those squares!! I am glad you are so happy with it cause it looks fantastic!!! 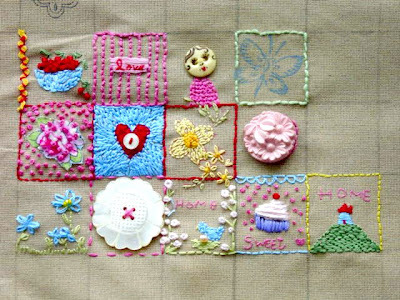 Amy - I just love the sampler. It is awesome. I haven't done embroidery in years - but maybe it is time to get going again. Gosh...I don't think I could pick a favorite square if I had too. Each one is adorable! I love it! What a cute idea. can't wait to see your finished piece. I'll have to try my own someday. 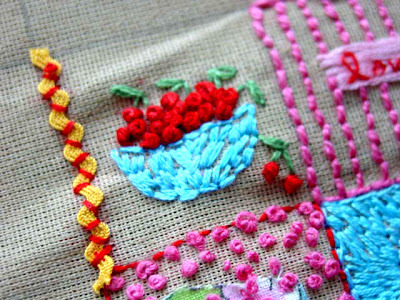 my favorite stitch is the french knot. Oh my, it is so wonderful!!!! I've got my linen out, that's a start!! I need 2 more hours in each day! Wow! you're cruisin'. I'm just curious, how big are those squares? and by the way, I love it!! Oh wow! It's so adorable! Very pretty! I love it... embroidery is so much fun... I actually pulled out my floss and traced my grandson's hand... I made a pillow with it for his Momma for Mother's Day. What an inspiration. I want to start one of my own "right now". Of course, I've got thirty jillion other things going and simply can't start another project right now. I think I will start sketching ideas. This looks like a great winter time project. I'm hopeless when it comes to french knots. I'll will check out the video you gave the link to - maybe there is hope for me yet. Seeing your beautiful sampler has made me go dig out the embroidery material and my husband just rolls his eyes-he says he just needs his one little corner..I can have the rest of the house. Ha...a few more hobbies and I may take it over too! Thanks for sharing and you are in my prayers. Amy, your french knots look great! Last year at SB Cori's mom taught us how to do a bullion stitch, you can make little birds nests with it,so cute! But seeing these cherries I'm going to have to give it another go! Love them!!! 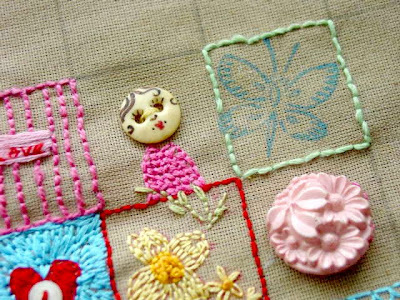 You will become known as The Queen of French Knots"
Wow-absolutely positively gorgeous--something I might REALLY be interested in--thanks! super cute...this is just wonderful!